Central Texas Rifle and Pistol Club in China Spring, Texas. Anyone who wears any color RWVA hat is invited to attend. Attendance is strongly encouraged. Aw, heck, let's just say attendance is mandatory. If you are unable to attend, please PM me to work out alternate arrangements. Also, if money, transportation or an angry spouse might get in the way of your attendance, let me know and we’ll work it out. We are a huge state and, therefore, a large group! This is your single, best opportunity to meet a large portion of the Texas cadre and talk, share stories, and learn from them. Border Raiders are welcome! Border Raiders are welcome! Border Raiders are welcome! I'm asking everyone to register via the Project Appleseed website. Friday (optional) - Club will be open to attendees starting at 3 PM. - Optional medical training course will take place from 6 PM to 8 PM. covering situations you might encounter on the range. - Interactive "Hands On" Instruction, History/strikes and safety breakouts all day! - Campfire and fellowship in the evening! - Rifle familiarization, KD Range Orientation/training, LibertySeeds, troubleshooting, State of the State, etc. Saturday - breakfast, lunch, hot Texas Dinner! ***While food, snacks, water and coffee will be provided, please feel free to bring your own if you have special dietary requirements. Please - no alcoholic beverages! Cost: $35 - (payable at the door) which includes $30 to cover meals, snacks and water for the weekend, and "range fee" of $5 for CTRP for the use of their excellent facilities! An Appleseed IBC is an intense, drinking-from-the-firehose, weekend of interactive classwork (indoors, all weekend), where all instructors will get plenty of hands-on instruction and mentoring, while building friendships and camaraderie. You shouldn't have any fear/trepidation about attending. Bring the skills you have, and be ready to learn. You WILL learn a lot, and have fun. Even (ESPECIALLY!) if you're a newbie, or it’s been awhile since you’ve volunteered at an event. We Need YOU! Blue Hats - get to know the instructor corps, see what goes on "behind the scenes”, learn how to help run a safe event, learn/practice the points of instruction and history in case you might want to change your hat color in the future. We want you doing POIs, breakouts, troubleshooting - everything! Orange Hats - this is a great way to boost your performance in 2019! You'll have ample opportunities to practice and polish your points of instruction, safety, and history skills. Red Hats - we need you! Our ideal ratio is 1 Red Hat for every 2 Orange Hats. Plus, this event will help to shake out the winter cobwebs that may have grown on your perishable skills. Shoot Bosses - You already know everything, right? Great! ALL Shoot Bosses should be at this event. This may be the only time we have such a large gathering of our cadre, and it's a great opportunity to make friends, build our team and relationships, and mentor. We will be in the meeting room. It seats 50 people, so we'll have plenty of room. There is camping on-site, but trailer hookups are likely non-operational. There are bathrooms and a nice kitchen for fine dining! 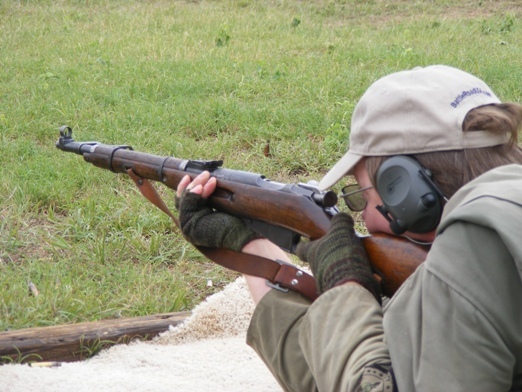 WE WILL HAVE CLUB MEMBERS AVAILABLE TO ACCOMPANY NON-MEMBERS TO THE RANGES! Do you have an AR-15, Garand, or M1A that needs sighting in? CTRP is a GREAT place to shoot out to 200 yards! During instruction time, there won't be any shooting, but there will be rifle familiarization - AR15, M1 Garand, M1A, AK, 10/22, 597 and 795. • Read "Paul Revere's Ride"
• Try to commit as much of the "cheat sheet" to memory - line commands, safety rules, steady hold factors, etc. • You have no need for that cheat sheet, right? • Be ready to discuss all aspects of the history - prelims, strikes, DOMs, etc. • ...I don't even need to mention the cheat sheet, right? Our mission is serious: the urgency of saving the country, and everyone's safety at our events. That being said, if you're not having fun doing this, YOU'RE DOING IT WRONG! Please check in here occasionally for updates. We'll see you all this January! Let me know how I can help. If possible, I'd like to pull together the Blue Hats that attend to ensure they are comfortable with their role and responsibilities, some Q&A, as well as to solicit suggestions. BTW, I've registered Padraic and me using both the Shoot sign up page in TIPS as well as the link below. You can count on me being there! I attended one a couple years ago. Learned a lot and loved it! Will you be ramrodding the IBC? Would love to, but January is my busiest month on my day job. Besides, Texas has its own Gray Hat to run Boot Camps - Scuzzy! I just remember you ran my first boot camp, in January of 2016. It was awesome. Besides, Texas has its own Gray Hat to run Boot Camps - Scuzzy! Well if I'm running the show I'm gonna order a keg of beer. Ahem...ITB, if you look at the original IBC post from last year (or was it the year before? ), I gave Michigan full credit for having stolen borrowed from your format. I will say, though, that AF5US did add some snazzy upgrades... Nicely done! Well gang, so far it's only shoot bosses signed up to attend, which sort of defeats the purpose. Anybody know if there are orange or blue hats who plan to attend, but haven't signed up yet? I'll PM/email a few and see if we can get them out. BTW: We've got Richard Jones to do Basic Medical. My understanding is that IIT3 Ammo Dog (Clint), IIT0 RiflemanforCHRIST, and his brother, IIT1 Curly 624 from Denton will be attending. I'm sure that Jason spoke with two newly crowned Orange Hats, Cecil and Mims, and Blue Hat, Cash, from last weekend's event will be joining us and I know that he spoke to the Orange Hats at the Trail Life event about registering. I have a new Blue Hat, wwbrock, that has been told and I need to follow up with him to register. A-lister posted that he's attending, but maybe he signed up using the link from Jason's message and hasn't also signed up using the Instructor sign up page. So, Scuzzy, you beat me to it. I was going to ask that you send an email all of the TX Cadre with a link to the IBC thread and a separate registration link. The forum is confusing for the newbies and those who don't frequent it very often. I'm in as a Red Hat. I think A-Lister and myself will be driving up together. Marshall here in an orange hat (Rifleman Nov 2018 Alice TX shoot). I am trying to see about attending for Saturday and Sunday (my wife may be a bit apprehensive). Getting going with this orange hat has been a slow process. I still have limited forum access, so I am not sure where to sign up, or if I am recognizable in the Appleseed books yet. If any information or guidance can come from this post it will be appreciated and hope to meet and see you all there. If this registration link doesn't work (To Register, Click Here: https://goappleseednow.org/?event=waco-tx-instructor-boot-camp-january-18-20-2019), then go the top of the message and click on the link below the scrolling "Border Raiders Welcome". You can add your wife as an attendee on the Registration page. This will give her the opportunity to learn about AS and meet other Instructors as well. The Registration Fee is collected when you sign in on Saturday morning. Looking forward to seeing you in a couple of weeks. Call if you still have any questions. Wow looks like i need to frequent the forum more often, sounds like a great weekend with the best of the best. Life seems to get in the way and unfortunately i'm already commuted to another event that weekend. look forward to getting to the range more in 2019 and earn a spot with the team. We will miss you. Instructor Boot Camps are offered across the country throughout the year. Ours happens to be in January this year. The advantage of attending our IBC is that you'll get to know other Instructors that you'll be working with in Texas, but you are welcome to attend any IBC in the country. We've got seven shoots scheduled through June in Ft Worth and hope you'll be able to attend and get your IIT training started. Call with any questions. Ok, thanks, I am all signed up. I can only attend Sat & Sun. Also working on a pair of Blue Hats from La Luz, NM. They're retired folks who spent the holidays in Florida, and there was talk of them adjusting their travel plans so they could attend the IBC on their way back home. I just sent them a nudge about that. They are GrandpaChuckie and Lauren. Last, I'm bringing a stowaway who hasn't yet gotten a hat. Jim assures me that is a situation that will be rectified at the IBC. His forum name is VXMakesMeTwitchy (dude has an odd sense of humor) and we will be traveling together. Since he doesn't have access to TIPS yet, he's only registered via the goappleseednow website. I sent a PM to several N TX Orange Hats and a couple of LA and OK border raiders. Have heard back from a couple of them but only Ammo Dog has been able to register to attend. Just heard from my blue hats, Chuck and Lauren. They were planning to join us, but a close friend died unexpectedly and they're going home to help her husband. They send their regrets and regards. One of the goals from 2018 was to up the numbers on the blue hats. That needs to be a goal in 2019, but I think progress is being made. I'm proud to say that my own KC5TEA has been helping in that regard. Well, gang? We're a week out. What's the plan? Who's bringing what for rifle familiarization, etc? OK - who else is volunteering? We need some volunteers to bring out rifles for show-and-tell. I'd like to have two of each there, if we can swing it. NOTE: If you have an unusual centerfire or rimfire rifle, please bring it out! Let's see what we have! Maybe I'll bring some materials and we can MAKE A TRAINING RIFLE at the range, for fun! Second strike will be done "History Boot Camp Style", which is very cool! I'll lead that. *Mrs. Smith? Can you tell us how El Paso uses these? Would there be any interest in a Mosin Nagant? Mingus 10/06 /Davilla RBC Eleven Oh Seven! Attitudes are contagious. I hope mine is worth catching.